In my view, raising the retirement age is basically the worst possible form that credible longer-term fiscal restraint could take. The way this works is that if you’re rich, the benefit cut in dollars and cents terms is very small since your life expectancy at 65 is already high. But if you’re poor, the benefit cut is much more severe. Except in real psychological terms it’s even more regressive than that, since poor people are more likely to have jobs that are physically taxing and generally unpleasant. So it sounds like a stinker of a deal to me. does it produce pretty modest savings, but it’s savagely unfair to the poor and the working class. 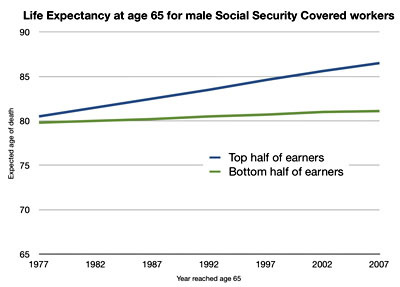 As the chart on the right shows, the life expectancy of upper income earners has gone up a lot over the past few decades, so even if you increase their retirement age they still have a lot more retirement years than they used to. But low earners? Their life expectancy has barely gone up at all. If you raise their retirement age, it entirely wipes out the tiny gains they’ve made. The bottom line is that high earners get longer retirements while poor people just tread water. And it’s even worse than that. Not only do high earners get long retirements, but they’ve mostly spent their lives working in cushy jobs that don’t wreck their bodies and are often fairly interesting. An extra couple of years of work isn’t that big a deal for them. But for truck drivers and coal miners and nursing home workers? That’s hard work that’s hard on their bodies, and it’s absolutely no fun. An extra couple of years of that is something to shudder at. But wait! It’s even worse than that! If raising the retirement age were the only way to address entitlement spending, maybe we’d have to bite the bullet and do it. But it’s not. There are dozens and dozens of better ways to do it. Social Security is quite easy to fix without touching the retirement age: there’s a nice list of options here from the CBO, and you’ll note that raising the retirement age is barely even a blip compared to all the other options. Medicare is more complicated, but it’s still the case that raising the retirement age (a) doesn’t save very much money, since healthcare costs go up rapidly the older you get, and (b) doesn’t change the rate of growth of Medicare, which is our key problem. Like it or not, the answer has to be found elsewhere. So why does this zombie idea continually resurface with such clocklike predictability? Two reasons, I’d guess. First, it’s a perfect sound bite. “Raise the retirement age” is a whole lot easier to understand than “Change the AIME bend points, reduce the top two PIA factors, and raise the taxable maximum to cover 90% of earnings.” So that’s what we get. Second, all the loudest voices come from highly educated, white-collar folks who write and talk for a living. They belong to, and speak for, a class that has interesting jobs that don’t tax their bodies, probably aren’t planning to retire at 65 anyway, and in any case, get paid well enough that they can retire early on their investments if they want to, regardless of Uncle Sam’s official retirement age. So it just slips their mind that a higher retirement age would be a way bigger deal to other people than it is to them. Basically, they need to get out more. Raising the retirement age is an idea that really needs to be buried once and for all. Social Security’s retirement age is already scheduled to rise to 67, and for medical care, age 65 is old enough already. There are plenty of other ways of tackling entitlements, ways that are both fairer and more effective. Anybody who really cares about this stuff needs to understand that.